Survey results prove that JA, at all levels, is preparing students to develop successful financial management habits, empowering them to explore the potential of becoming an entrepreneur, and providing them the skills necessary to succeed in a global economy. In March 2015, Junior Achievement USA unveiled the results of a six-month third-party meta-analysis studying the impact of volunteers delivering education-oriented youth development programs. The purpose of the study was to explore and quantify the value of using volunteers in JA USA programs. A key result: the majority of our volunteers who are first-timers tell us they would come back and volunteer again. This is an important finding because research indicates that one of the best predictors of willingness to volunteer is tied directly to the level of impact a volunteer believes they are having on a program participant. JA volunteers believe they are having an impact on students. JA helps improve Math and Reading scores and boosts Critical Thinking and Problem Solving! The University of Louisville recently concluded a study measuring the impact of Junior Achievement programs. The results revealed that students who attended Junior Achievement programs showed a significant increase in math and reading scores than their counterparts. We are proud to make a difference in the lives of our students and the community, and we work every day to improve and enhance the experience and skills we offer our students. External evaluators found that elementary school students who participate in JA demonstrate significantly higher critical thinking and problem-solving skills than their counterparts. Teachers (95%) and volunteers (92%) report that students who participate in JA have a better understanding of how the real world operates. Both teachers and volunteers agree that JA students work together better as a team and are more capable of making group responses. 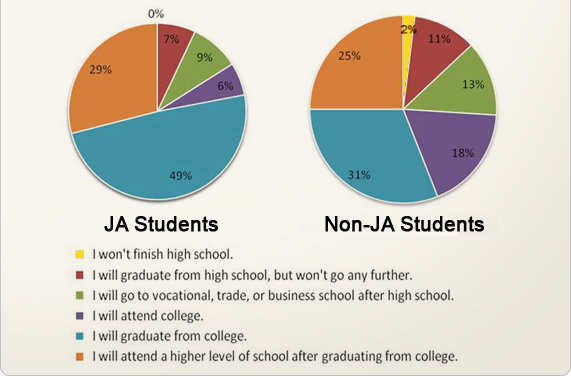 High School Programs – JA Students Have the Competitive Advantage! The majority of students (79%) agreed that JA positively influenced their attitudes toward continuing their education. JA students were more likely than students in general to matriculate to college immediately after high school (77% versus 69%). Further, most students reported that JA made the transition to college easier, encouraged them to work hard, and provided them information that was relevant.